Green Alliance What do people really think about the circular economy? What do people really think about the circular economy? Resource efficiency is a major new tool for climate policy. But a successful transition to a low carbon, material efficient economy will only be possible if businesses and government design policies that people accept. The public overwhelmingly believes that society must use resources more wisely. But this broad backing does not mean there is support for all resource efficiency strategies: the public like some more than others. Green Alliance hosted this event to launch a new report for the Centre for Industrial Energy, Materials and Products (CIEMAP). After an overview of the report by Green Alliance's senior policy adviser, Libby Peake, and Professor Nick Pidgeon of Cardiff University, a panel of experts from industry, academia and the NGO community discussed new research into which resource efficiency policies people currently like and which they don’t – and why – and what this means for the government, policy makers and businesses. 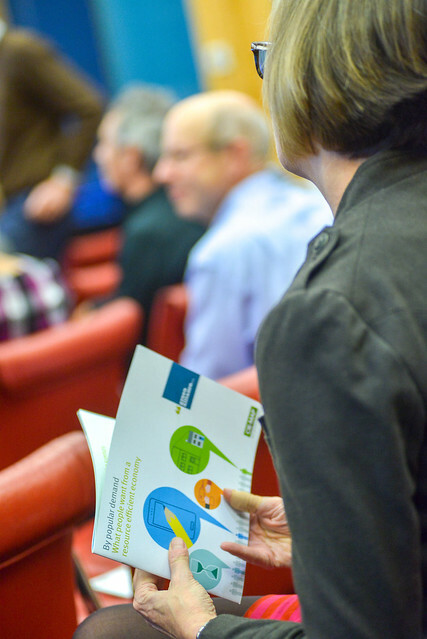 Read the report 'By popular demand: what do people want from a resource efficient economy'.